Blue seems to be happening in my garden again, so we would like to share a simple arrangement of more blue this week for In a Vase on Monday, hosted by Cathy at Rambling in the Garden. This is Hydrangea macrophylla ‘Endless Summer’ in a Wateford crystal vase. The color of ‘Endless Summer’ is this lovely pale blue. My Arranger sprinkles a half cup of soil acidifier around each one in the spring to get that blue color; otherwise we might have a bit of pink, which I find equally as lovely. Please visit Cathy at Rambling in the Garden to see what she and others are sharing from the gardens this week. 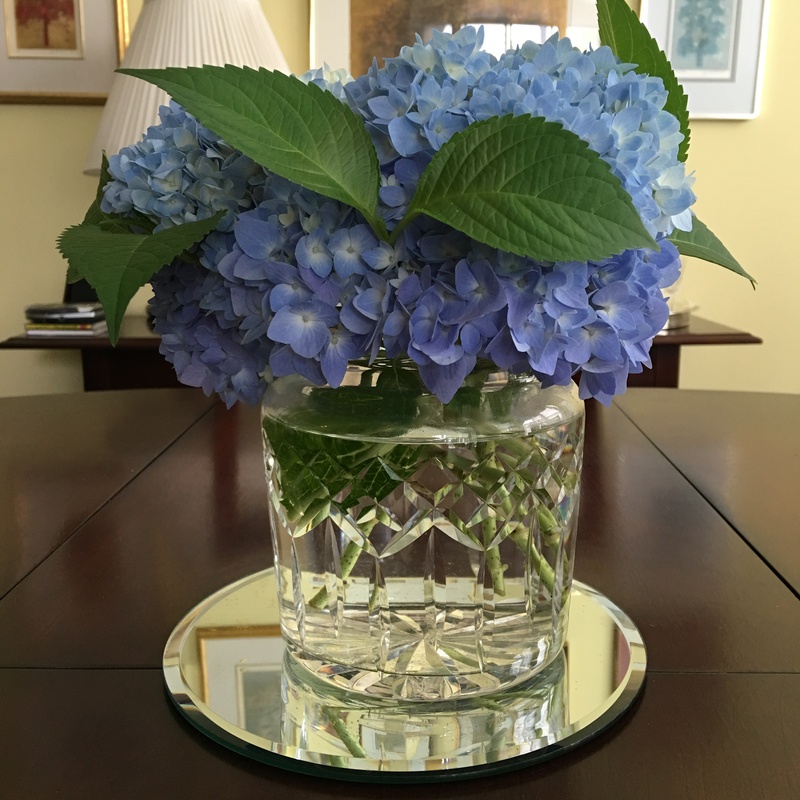 This entry was posted in In a Vase on Monday and tagged 'Endless Summer' hydrangea, Rambling in the Garden, Waterford crystal vase. Bookmark the permalink. You can’t have too much blue. Gorgeous. Love that blue–thanks for the tip! Blue is such a refreshing color. Love the vase too. Thank you, Marian. The hydrangeas are in such abundance now that it seemed right to show them alone. 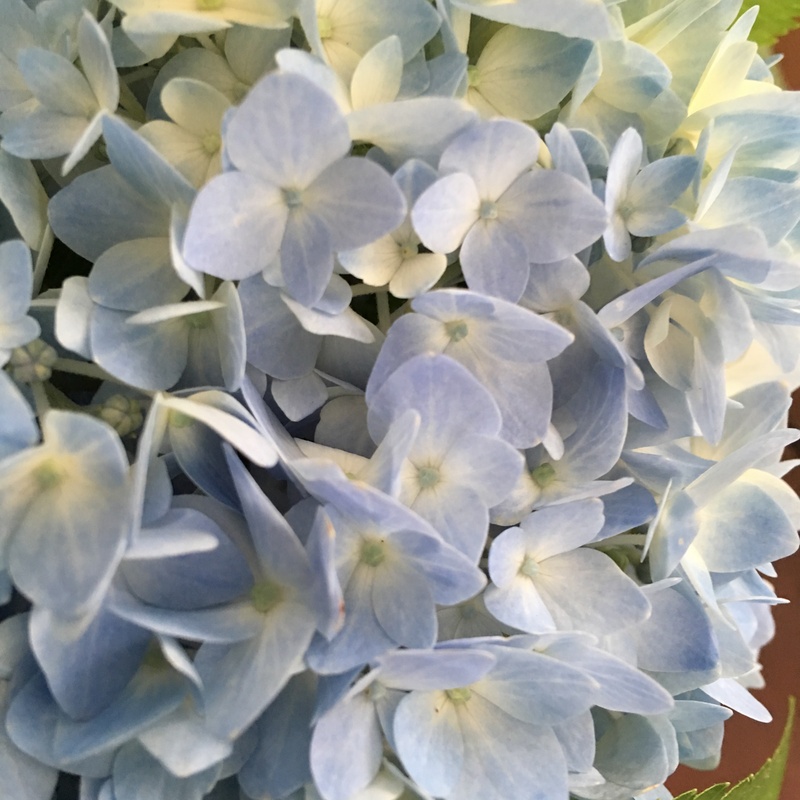 I wish my ‘Endless Summer’ bloomed blue but our clay is too alkaline, even if treated….and with all the late freezes all the hydrangea are regrowing from the base. If I get one flower I will be lucky. So I will swoon over your blue hydrangeas! Thanks, Donna. That was the problem we had last winter…a couple of late frosts and ES never caught up. I think we only had one bloom. Thankfully this is a new year. We can never have enough blue! The vase (and arrangement, of course) are simply beautiful. Such a nice, soft blue. I love the vase and the mirror is the perfect touch. Thank you, Eliza. My Arranger should get all the credit. 🙂 Pass it on please! A lovely cool blue and a beautiful crystal vase. Very refreshing. You are kind to say so. Thanks. That Hydrangea is a beautiful blue! Thank you, Kris. One of my favorites, obviously. Thank you, Cathy. We are indeed having fun with your meme. That’s a gorgeous image – so refreshing. Thank you. And I’m glad you like the blog.